Created at the request of students and customers who have expressed their desire for a portable version of the educational wallchart: "A Correlated History of Earth" which includes plate tectonic maps, geostratigraphy, surface geology, ice ages, magnetic reversals, major volcanic flood basalts, orogenies, impact craters, classic sites, the fossil record, mass extinctions, and genetic timescale. Also includes "A Correlated History of Matter" on the other side. 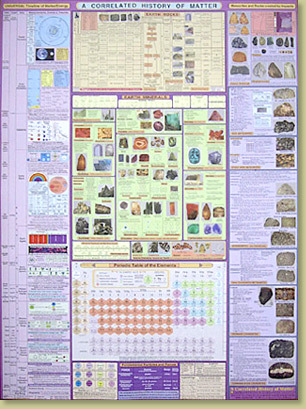 The detailed natural history timeline is extended back to the big bang and additional reference material for geology, astronomy, mineralogy, meteoritics, chemistry and physics has been added. This folded chart fits easily in a pocket for quick reference. 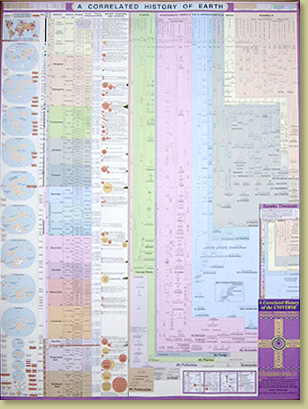 Double-sided fold out chart, printed on thick poster paper.